At the start of the month I headed to Hadrian’s Wall to attend some of the Roman events taking place to celebrate the 30th anniversary of Hadrian’s Wall being a UNESCO World Heritage Site and 1,900 years since Hadrian became Emperor. Hadrian’s Cavalry was the theme chosen for the celebrations with a fantastic programme of public talks, Roman-themed re-enactment events and a major exhibition along the Wall. The most spectacular event was the Turma! Hadrian’s Cavalry Charge in Bitts Park in Carlisle. On Saturday 1st and Sunday 2nd of July 2017 and for the first time in about 1,500 years, a full turma of Roman cavalry, the Roman name for a 30-strong cavalry, was brought together to perform some of the manoeuvres that would have been done at the time of Hadrian. The event was one of the biggest Roman cavalry re-enactments ever seen in the UK and it attracted huge crowds of people who watched on during the three performances. It featured in both the Guardian and the Telegraph as one of 2017’s must-see events. The Turma! event was part of the Hadrian’s Cavalry exhibition which is currently taking place across 10 sites along Hadrian’s Wall. This unique series of exhibitions celebrates the cavalry regiments that once guarded the northern frontier of the Roman Empire by exploring the role and daily life of cavalry soldiers. The exhibition runs until Sunday 10 September 2017, from Maryport in the west to South Shields in the east, and each site focuses on different aspects of the Roman cavalry and has its own special exhibition of objects from their own collection or on loan from national and international museums and private collectors. Historically, a cavalry display took place in a parade ground situated outside a Roman fort and involved the cavalry practicing a series of charges and drills and the handling of weapons such as javelins and spears. 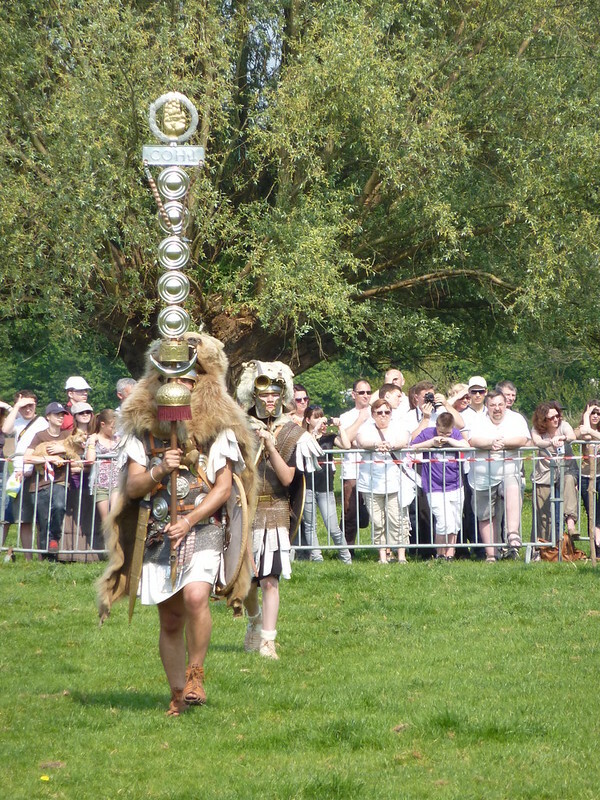 These parades were called “hippika gymnasia” and were described by Arrian as glamorised versions of training exercises, performed in decorated armour. They were colourful tournaments among the elite cavalry of the army, the alae, and played an important part in maintaining unit morale and fighting effectiveness. The audience was invited to join separate teams (the red team and the blue team) and was provided with a team flag to wave to cheer on the horsemen as they tried to score points throughout the competition. I was supporting the blue team at the 1st tournament on Saturday and the blues won. The event started with the Ermine Street Guard re-enacting a unit of the Roman army which served in Britannia. They performed battlefield drills and demonstrated the use of their weapons. Then the emperor Hadrian himself entered the parade ground accompanied by the draconarius, the signifer who bore the cavalry standard known as a draco. Draconarius and decurio. The decurio was the officer in command of a turma. The highest ranking decurion was called the decurio princeps. Hadrian was followed by the cavalry, clad in authentic Roman armour and kit. The highest ranking, most skillful riders entered the arena first, wearing full face-mask helmets. The turma then performed the basic formation in two ranks, charging en masse as speed increased. The turma performing two perfect ranks. The cavalrymen then split themselves into their teams, the reds and the blues, and what followed was an elaborate display of training exercise, horse handling skills and javelin throwing. A group of mounted javelin throwers then circled the parade ground and charged, throwing three javelins at a target. This military tactic was called circulus cantabricus (the Cantabrian Circle). Further cavalry formations were performed in front of emperor Hadrian. The turma at the canter in two ranks brandishing spears. The turma in wedge formation (cuneus), brandishing spears. The cavalry would regularly perform these exercises to illustrate their skills and prowess in front of the Emperor. The cavalrymen receive the Emperor’s praise! Some of the cavalrymen wore elaborate face-mask helmets which, according to the historian Arrian of Nicomedia, military commander and close friend of Hadrian, were only worn for displays in military parades like the hippika gymnasia. Three mounted elite riders from the blue team wearing face-mask helmets. Calvary helmets were made from a variety of metals and alloys, often from gold-coloured alloys or iron covered with tin. They were decorated with embossed reliefs and engravings depicting the war god Mars and other divine and semi-divine figures associated with the military. Such helmets are currently displayed in the multiple museums along the Wall as part of the Hadrian’s Cavalry exhibition. Most notably, the privately owned Crosby Garrett helmet, one of the most significant archaeological finds in Britain, is back on display at the Tullie House Museum and Art Gallery in Carlisle. Two Ribchester style helmets displayed together for the very first time at the Great North Museum in Newcastle. The exhibition also features other iconic Roman Cavalry helmets on loan from national and international museums including two Ribchester style helmets which are displayed together for the very first time at the Great North Museum in Newcastle, a complete Butzbach style helmet which is displayed at Segedunum and a helmet from the Roman fort at Newstead in Scotland which is displayed at Vindolanda. A mounted elite rider from the red team wearing a face-mask helmet. After the 90 minute Turma! ended, the audience could meet and talk to the soldiers and even touch the horses. Hadrian and the Ermine Street Guard on the march leaving the parade ground. The two key texts for understanding the Roman cavalry training are Hadrian’s adlocutio from the parade ground at Lambaesis in Numidia in 128 AD and Arrian’s Ars Tactica which was written in the reign of Hadrian. The speeches were memorialised on an inscription placed in the middle of the parade and exercise ground located two kilometres west of the main fortress at Lambaesis. It was carved on the corner pillars of a viewing platform topped by a Corinthian column, perhaps crowned with a statue of Hadrian (M. Speidel). It is the only surviving example of a speech from a Roman emperor to his soldiers. Traduction by M. Speidel: To Emperor Caesar Trajan Hadrian Augustus, most gallant and most generous, the Third Augustan Legion, training field and army having been approved. The emperor Hadrian on horseback at the Turma! event. Per Lineam Valli: Did Roman cavalry wear face-masks in battle? Thanks Carole. Those were the days that we enjoyed when we were involved with re-enactors. The Ermine Street Guard always put on a good display. Have you been to Kirby Hall yet with English Heritage.? What a fantastic post! On the top of my bucket list is to walk Hadrian’s Wall. I so appreciate you taking the time to post so many pictures and videos for those of us who weren’t there to experience it in person. What an incredible experience. A turma isn’t an event. It’s the Latin word for a cavalry squadron. The article seems somewhat confused about this. I know, but the event was called Turma! We were cheering on the same side, Carole! Thanks for posting about this months ago, we never would have made it without you! It was fantastic!! Thank you, enjoyed watching and reading this.